The minimum group size for this activity is 8 people. 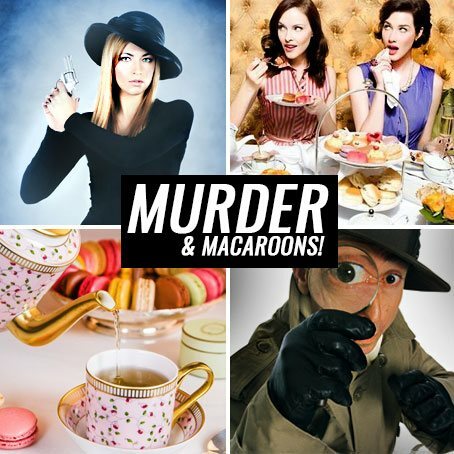 We present to you Murder & Macaroons! Ticking all the boxes of afternoon entertainment, food and a cheeky drink, this 1920’s murder mystery is sure to be a hit! Hosted within a private dining area just for your group, take part in secret missions, try to solve the mystery and be entertained by our professional actors. All this plus you’ll indulge in a selection of cakes, sandwiches, pastries and a glass of bubbly too. Murder & Macaroons is a fabulously funny Vintage mystery ideal for groups of 8 or more. PLOT: “It is 1926, and you are invited to the isolated village of “Spinster-On-The-Shelf”, where a body has recently been found in the local Tea Rooms. As suspicion, intrigue and rumour run wild in the village, you must help solve the crime and expose the killer….Is Buntie Berkeley-Hunt, the local flapper girl, as innocent as she looks? Is Prince Albert, owner of the rival Tea Rooms, really royal – or is he a common fraudster? Who are the strange figures lurking in the shadows? And who is the Tea Shop’s mysterious new Kitchen Assistant? Find out all this and more in our hilarious 1920s themed Murder Mystery Event.” The minimum group size for this activity is 10 people.